I will save you the story of how I managed to get home tonight instead of tomorrow morning, but it would suffice to say that between a hot shower and seeing my parents, downloading this VN was pretty high on my "as soon as I get off the train" priority list. The torrent is coming in as we speak. Gentlemen, it has been an honor and a pleasure to be a member of your community, to speak with you, and to share your experiences. I think that it is telling of the quality of this game and of the people here that I sincerely believe that once I am done with it, I will remember the hours spent here on the forum to be at least as pleasurable as those spent playing the game. I would like to believe that I have been an indirect witness to the creation of a masterpiece as unlikely as it is beautiful, and would like to remove my hat before all of you. Good night, friends. I have a game to play. Minister of Gloom wrote: I will save you the story of how I managed to get home tonight instead of tomorrow morning, but it would suffice to say that between a hot shower and seeing my parents, downloading this VN was pretty high on my "as soon as I get off the train" priority list. The torrent is coming in as we speak. Got my feet in the air and my head on the ground. Thank you, Four Leaf Studios. I broke down and used the torrent. griffon8 wrote: I broke down and used the torrent. I think probably everyone but me broke down and used torrent. Also, judging by your signature, you either have Rin ranked last on your favorite list or my eyes are broken. Building up to Shizune? tony246 wrote: Also, judging by your signature, you either have Rin ranked last on your favorite list or my eyes are broken. Building up to Shizune? That is correct. I'm playing them in reverse order of preference. Except now that I've completed Lilly & Hanako they switched places. 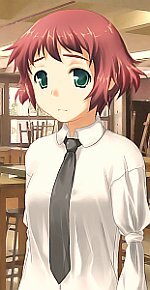 Congrats on the fifth anniversary of the release of Katawa Shoujo. In that time you've touched the hearts and changed the lives of countless people, myself included (although I discovered KS a couple years late), and I think made the world a better place.